You want to address sudden hearing loss as soon as you notice is so that it can be treated correctly! While it can be frightening, sudden hearing loss is a fairly common occurrence. Known as Sudden Sensorineural Hearing Loss or SSHL, it can strike quickly and occur in one or both ears in a period of one to several days. If you notice symptoms of SSHL, make sure to contact a doctor immediately. Not only can waiting cause the condition to worsen, but it may also be a sign of more significant health issues. Making sure to practice proper ear health and making regular hearing test appointments can go a long way to preventing problems, but here’s what you need to know if sudden hearing loss occurs. Most commonly, sudden hearing loss is caused by noise damage, but it can also be caused by a variety of other things such as Cochlear Cross Sections. If blood flow is lost or reduced to the cochlear, hearing loss can occur. Additionally, a person’s medical condition, stress, and tinnitus can cause hearing loss. Lastly, swimmers ear, Ototoxic drugs, and infectious diseases can all cause variations of SSHL with varying lasting times. How Is Sudden Deafness Diagnosed? Having an up-to-date medical record is essential when it comes to diagnosing sudden hearing loss. Your personal medical history and medications will be reviewed for a cause before any further tests are performed. To check if your hearing loss is caused by obstructions or sensorineural deficits, a doctor will check your ears. Depending on the findings, further examination may be required. Depending on the cause and severity of the hearing loss, treatments for sudden deafness may vary. In some cases, a round of corticosteroids (medication that helps reduce inflammation) might be used, or hyperbaric oxygen therapy, which is used to reduce infections and increase blood flow. 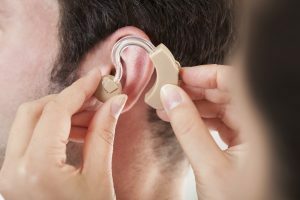 If no other treatment can be of use, hearing aids might be necessary. SSHL can lead to more severe health complications, which is why if you or a loved one experience sudden hearing loss it’s best to act immediately. Ready to do something about your hearing loss? Our Doctor of Audiology, Dr. Trisha A. Bents Muth, is exceptionally experienced in the art of audiology, and provides the absolute best solutions. Bay Area Audiology has been working to give patients a comfortable environment, with thorough evaluations. We are independently owned, and unbiased when it comes to finding you the care you need. This entry was posted on Friday, May 18th, 2018 at 10:16 am. Both comments and pings are currently closed.